Fun Fact: Kammerer received the first ever Zell B. Miller Leadership Award during the 2011 Commencement ceremony. All YHC alumni receive a 15 percent discount off one item! Pick up your registration materials, a full schedule of events, nametags, your Alumni Weekend T-shirt ($10 pre-purchase), and anything else you might need for the weekend. Join us at Gibson’s for tater tots. Receive a 50 percent off coupon upon arrival. A full lunch is available. Pay at the door. 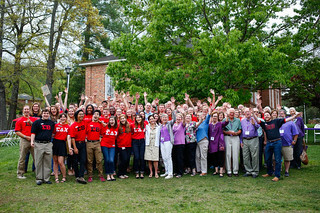 Are you bringing your college-bound children to Alumni Weekend? Make plans to join them on a Legacy Tour and information session sponsored by YHC’s Office of Admissions. Pre-registration is suggested. Light refreshments will be provided for the Class of 1969 and their guests. All alumni are invited! Free admission and special VIP tables are provided for Class of 1969 members celebrating their 50th reunion and induction into the Half-Century Club. Other milestone reunion classes should contact the Office of Alumni Engagement to request reserved group seating. Free admission for Class of 1969 members, $20 for all Half-Century Club members (including Class of 1964 members celebrating their 55th reunion), $30 for all other alumni and guests. Pre-registration is required. $8 per alum, $8.69 per guest. Pay at the door. $8 per alum. Pay at the door. Sponsored by the SPAT Club. All alumni and friends are welcome. All Phi Chi alumni and guests are welcome. Stop by to purchase a raffle ticket to win a Big Green Egg! All proceeds benefit student scholarships. Mingle with YHC President Dr. Drew L. Van Horn, retired faculty and staff, and fellow alumni. Special recognition will be given to this year’s 50th reunion class and alumni award recipients, as well as the Alumni Association Board, Young Alumni Council, Class Coordinators, and emeriti and current faculty and staff. Mix and mingle with generations of YHC alumni and friends, as well as emeriti, retired and current faculty and staff. Live music by Border Hop Five, Hal Misseri, ’95, John Events, ’99, and friends. $10 per person. Free for children 12 and under. Pre-registration is suggested. Calling all ages, classes, Greek organizations or your own special group! Bring tents, chairs and refreshments to enjoy an afternoon visiting with classmates. All alumni and guests are welcome. Children’s activities provided by Chick-fil-A Winshape Camp. All Susan B alumni and friends are welcome. Enjoy a traditional chapel service and time of remembrance led by YHC Chaplain and Dean of the Chapel Rev. Blair Tolbert. A class photo will be taken at 3 p.m.
Purchase your plaza brick before April 15, and be a part of this campus tradition. Bricks can be purchased on the YHC website. Celebrate while enjoying live music and complimentary snacks and beverages. Classes are welcome to gather in celebration of a milestone reunion or casually mingle with classmates. A live performance will be provided by the Phi Chi Band! Join the Class of 2009 at their tent on the lawn. Grab your fellow alumni and smile for the camera! You just might see yourself in a future issue of Echoes magazine. Take a short walk over to Hesed House to hear ways that Young Alumni (Classes of 2005-2019) can support current students at YHC in exciting and new ways. Enjoy a beer and engaging with your fellow classmates on how you can make a difference! A caravan to Bell Mountain will leave from the Campus Plaza. Some transportation will be provided (limited space is available on a first-come, first-served basis). $10.75 per alum, $11.41 per guest. Pay at the door. $25 per person. Pre-registration is required. Bring an instrument to jam, or relax and mingle with friends and family. 8:30 a.m. and 10:55 a.m.
$12 per alum, $12.75 per guest. Pay at the door.